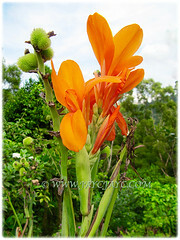 A Canna cultivar that had us smitten when we visited a garden nursery in our neighbourhood. That was seen almost ten years ago. We grabbed a pot that was showing a budding Canna. Did not know how its whole blossom would be like, though anticipating that it would be strikingly beautiful. We just realised that an article about the Canna with its showy and diverse colours must be done pronto, lest we overlook them again. 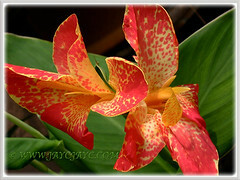 Botanical Name: Canna, followed by its cultivar name. 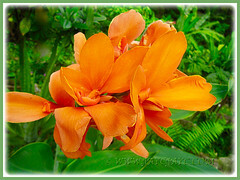 Etymology: The genus name, Canna comes from the Latin word, in reference for a cane or reed. Origin: Native to tropical and subtropical regions of the New World, from the southern United States and south to northern Argentina. 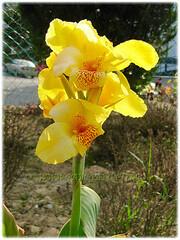 It is a hardy plant that is cultivated worldwide. 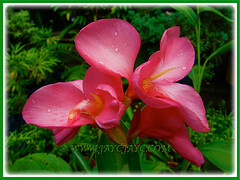 Plant type: An ornamental, tropical and subtropical perennial. 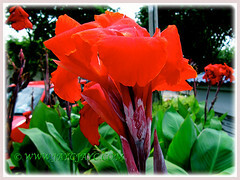 Features:Canna is the only genus in the family Cannaceae consisting about 20 species of flowering plants, and very popular with horticulturists and hybridisers who have produced many cultivars.It is a herbaceous perennial that reproduces vegetatively by underground rhizomes which store starch, and it is considered to having the largest starch particles of all plant life. 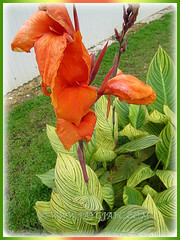 Cannas range from dwarf cultivars as small as 0.5-1 m tall, to medium varieties from 1-2 m in height, to tall plants over 1.5 m.
Canna Lily produces broad, flat and alternate leaves that grow out of a stem in a long, narrow roll and then unfurl. 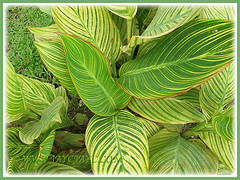 Their leaves are generally solid green, but some cultivars have glaucous, brownish, maroon or dramatic variegated leaves like the Canna cv. Bengal Tiger. 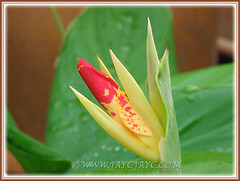 Their flowers consist of three sepals and three petals. They come in various colours, can be red, yellow, orange or combination of these and randomly speckled too. 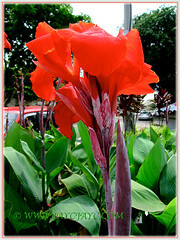 Culture (Care): Canna and its numerous cultivars can be easily grown with least maintenance. Light: Best in full sun or partial shade. Direct sun may bleach the foliage. Moisture: Average water requirements. Water moderately and regularly. Overwatering can cause root rot. At lower temperatures, water sparingly and allow soil surface to dry slightly between watering. Others: Feed once monthly with a balanced liquid fertiliser for foliage and flowering plants. To keep plant tidy, prune off brown or withered leaves together with stems and spent flower heads. 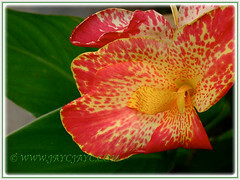 Canna and its cultivars are generally free from serious pests and diseases. However, it is attractive to slugs and snails, leaving large holes in the leaves. Check for infestation of Red spider mites that may cause problems to gardeners. For subtropical and temperate regions: Hardiness: USDA Zones 8 through 12. Keep Canna’s rhizomes protected during winter if temperature falls below zone 8. Remove rhizomes from the garden and prune the foliage for easy handling. Clean and dry the rhizomes. In zone 7, wait until all danger of frost is past before planting the rhizomes in spring. Water and feed sparingly in winter but water well during summer. In non-hardy regions, it can be grown outdoors in summer. Alternatively, plant them in containers to overwinter indoors. Propagation: Can be propagated by seeds or by division of rhizomes with a growing point. 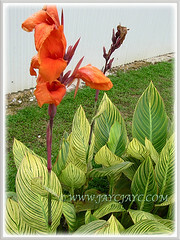 Usage: Canna with its showy and diverse colours is an impressive ornamental plant in any garden. 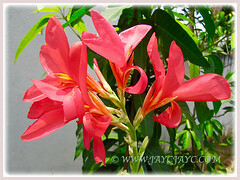 It is most ideal as a container plant, located outdoors in the garden, porch, deck or patio. Excellent too when planted in borders or as groundcovers under large shady trees. An attractive tropical ornamental and landscape plant that will look great as a stand-alone specimen or grown in front of a perennial border as well.